Why glyoxysomes only in seeds? Even the giant tree starts its journey from a small seed, which is compacted with all necessities that lead all the way to great heights from a very humble beginning. The organelle glyoxysomes just designed for this take off is exclusively present in oil rich seeds. Seed germination is a high energy consuming process. Glyoxysomes are the organelle with all necessary enzymes for efficient utilization of energy rich lipids. How glyoxysomes assist in fatty acid metabolism of seeds? During seed germination of oil rich seeds, the stored lipids are hydrolysed to glycerol and fatty acids by lipase. Fatty acids are broken down by β-oxidations. What is the site of β-oxidations in plants, plant seeds and in animal cells? β-oxidation occurs in glyoxysomes in plant seeds. Remember, in other plant cells it occurs in both glyoxysomes and mitochondria. In animal cells, mitochondrion is the site of β-oxidations. 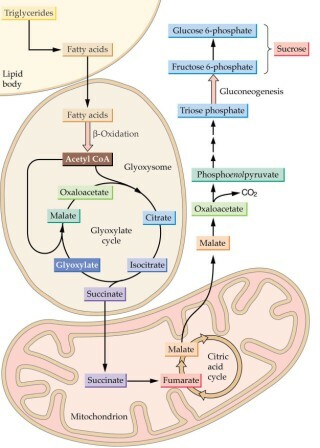 In plant cells, the product of β-oxidation, acetyl –CoA enters glyoxylate cycle rather than Krebs cycle. Oxaloacetate and acetyl CoA-> citrate by the enzyme citrate synthetase. The end product of the cycle is succinate. Succinate is converted to oxaloacetate in mitochondria (as glyoxysomes lacks fumarase and succinic dehydrogenase for that conversion). The oxaloacetate formed is converted to phosphoenol pyruvate, finally converted to carbohydrates (monosaccharides like glucose or fructose, disaccharides like sucrose and polysaccharide like starch).